The Bagheera Kiplingi Spider Is Unique Among Spiders Because Of Its? Which Sea Creatures Originally Lived On Land? Spiders evoke a certain bloodthirsty and cunning image in our minds. We watch horror movies with giant spiders and marvel at the speed and efficiency with which they capture and cocoon their prey. We’re thankful that they’re tiny and rarely venomous instead of car-sized and bent on hunting us. But one thing spiders definitely don’t call to mind is… vegetarianism. Yet, if you travel to Central America and poke around the jungles of southeastern Mexico and northwestern Costa Rica, you’ll find a tiny spider named Bagheera kiplingi. Although a dead sample of the spider was identified and named over one hundred years ago, it was only recently that scientists were able to observe the species in the wild where they, rather surprisingly, found that it sustained itself almost entirely off a plant-based diet. Rather than use its highly accurate jumping skills to leap onto prey, it spends most of its energy avoiding becoming the prey by leaping away from aggressive ants defending acacia plants while swiftly moving about the plants to snack on the nutrient-rich buds found thereon. 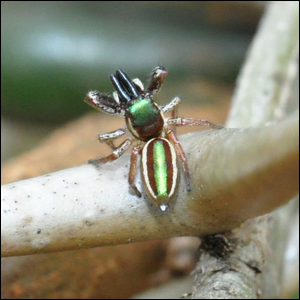 Rarely, if the opportunity presents itself, the spider might munch on some ant larvae, but the spider is the only known species among the 40,000+ identified spider species worldwide to sustain itself on plants instead of prey.